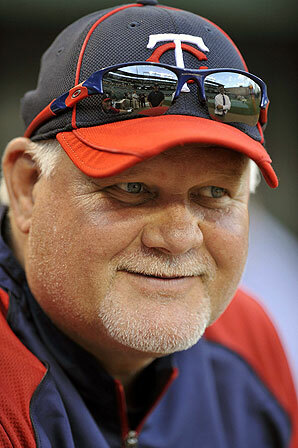 Ron Gardenhire's job is not all easy-peasy this season, so every win is going to be a big one. The Minnesota Twins' next victory however, will be one of the biggest milestones in his managerial career. Last season, the Twins had to win just 10 of their final 28 games to give their skipper his 1,000th win, but fell just short due to a number of reasons, ineptitude being a small factor. But it's a brand new year and hope springs eternal in April! After 12 seasons with the team and a 998-947 record, he was able to extend his contract for an additional two seasons and chase his 1,000th win into 2014. Of course, he'll be the first to say that he doesn't even think about it until the media or his wife Carol, who is along on the road trip through Chicago and Cleveland, reminds him. The 2010 American League Manager of the Year, who has led the Twins to six AL Central titles, will be the 60th manager in history to hit 1,000 in the win column and the 8th since 1961 to get there with just one ball club, joining the likes of Tom Kelly. If the rain holds off, Gardy will have a shot at it this afternoon when Mike Pelfrey takes the hill against fellow right-hander Danny Salazar in front of a rowdy, sellout crowd for the 20th anniversary of Progressive Field at the Indians' home opener. Send love letters and hate mail to babeslovebaseball@gmail.com and like Sooze! on Facebook for instant access to new articles, photos and more. Happy Twins Home Opener - Enjoy the festivities! The Minnesota Twins will pay tribute to Jackie Robinson with "Celebrate Diversity Day" tonight at Target Field. You're skipping school, you're skipping work. Happy Twins Home Opener. Whether you're a fan of the Twins manager or not, he's on the verge of a pretty impressive milestone. Aaron Hicks has already made leaps and bounds compared to last season. The Twins have made some changes to the rotation, but will that be enough to keep them out of the AL Central basement?